The first boss battle - Tarantula Mk V.
Before the era of deep stories, rich worlds, and morally based decisions, computer games had to catch the players’ attention by other means. The main character, level design and gameplay mechanics had to be iconic enough for the players to fall in love with. Even though the technology evolved and games have more means to keep us entertained there are some elements that never changed. One of them is boss fights. Bosses in video games keep the players honest and the game flow in check. A good boss fight is difficult, but not frustrating. It simply requires making use of the previously introduced mechanics, sometimes in an unconventional manner. It is not an overpowered heap of meat with lots of health. It’s a gateway to the next level of gameplay awaiting the protagonist, often entirely different than before. Vertical scrolling shooter gameplay prototype - circa 2011. We wanted X-Morph: Defense to follow this philosophy. The initial concept for the game we had was a side-scrolling shooter, much like River Raid. We wanted to set each level in a unique environment and finish each one off with a final encounter with a boss, giving a sense of closure. We ended up designing 11 biomes and their bosses. However, it turned out that the visual representation and design of the enemy is not even half of the necessary work. In the final version of the game, we included 4 boss encounters and an additional one in the European Assault DLC. In this series of articles, we would like to show you both the bosses who made it into the final cut, and those who didn’t. We will describe the production process, the initial design, and the end effect. 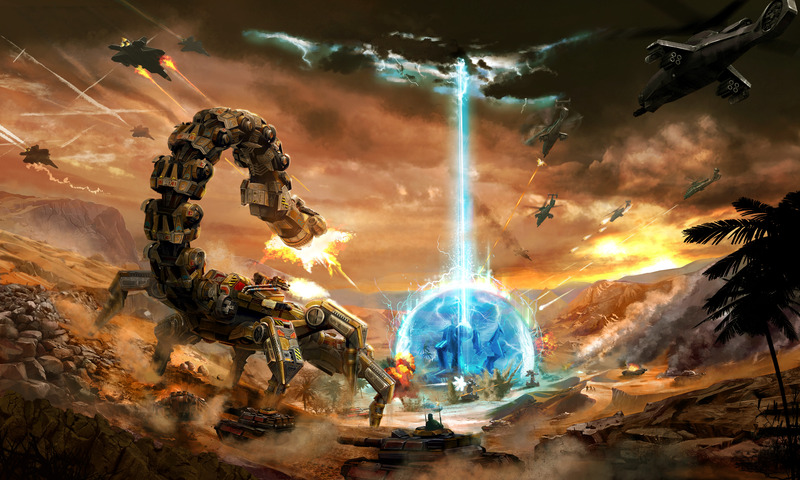 The Scorpion boss starred in one of the game’s main concept art pieces. Let’s kick our series off with one design you might have already seen on some of our concept arts. This creepy crawler was supposed to be the final foe of the Egyptian desert level. It’s not the biggest contraption we’ve ever designed, but it would be nightmare-inducing for sure. With multiple smaller weapon systems and a massive laser at the end of its tail, the X-Morph would definitely feel the sting of the scorpion. 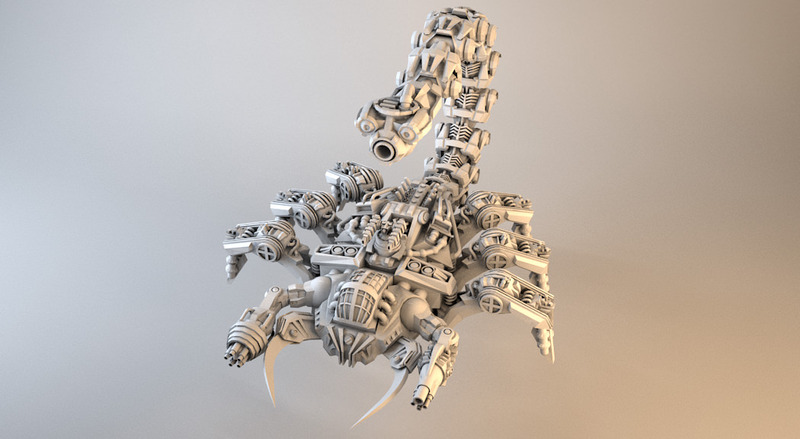 Scorpion boss render without armor plating. Imagine this scenario. You’ve just fended off a couple of waves of enemies and suddenly the ground starts shaking. You can hear the rumble of something massive underground. Then, all of a sudden, the boss emerges from beneath the sand. You start the defense of your core and as the fight progresses you learn that the scorpion can dig into the sand and unborrow elsewhere! Sample animations with in-game objects to scale. This kind of behavior is unprecedented in X-Morph: Defense. Moreover, contrary to what you see while fighting other bosses, it would not follow a specified path but freely move, forwards, backward and sideways. As for the arsenal employed against the player, that consisted of a classic minigun, an AA flak cannon, a scattergun capable of launching grenades (effective against towers), the tail laser and the tail itself. Yes - the fighter could be blown out of the sky with a massive swing of the tail. In order to defeat this behemoth, the player had to find the weak spots and there were a couple of ways to go about it. The first, and perhaps most obvious, were the legs. If all 6 were critically damaged, the whole construct would fall down. The second was to destroy the cabin. 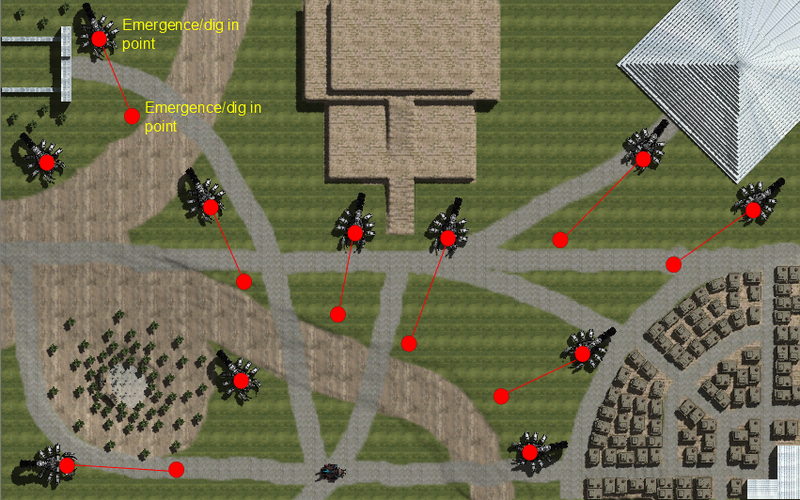 In order to do that, the player would have to disable the shield generators first, and then destroy the command bridge. Also, the tail could be damaged in a way that would destroy the whole machine. Our graphics designers have done a great job with this one. We had the art ready in no time and the model followed shortly after. Based on what can be seen in nature we’ve made the basic set of animations. After applying textures we had a pretty good idea what it could look like in the final product. Based on that we went on to design the hitboxes, which followed the initial concepts we had for the various systems comprising the boss. 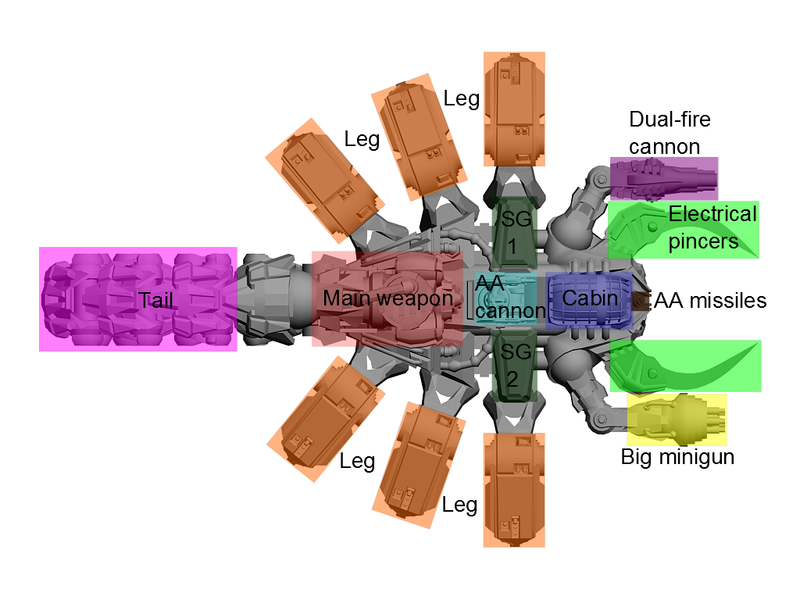 Scorpion boss hitboxes and weapons. The whole battle was supposed to be mixed with fending off even more enemy waves, requiring the player to switch between protecting the towers and the core form the scorpion, and crowd control. We wanted the terrain to be much like a real desert. Units were supposed to slow down while walking on sand or climbing dunes. We wanted the fight to be both exciting and full of opportunities for strategic outplay. Initial level layout and gameplay concept. In the end, the boss battle, unfortunately, had to be removed and the entire level design was changed. Although it seemed that most of the work was behind us, it was only the tip of the iceberg. After designing the battle sequence we realized that it would take ages to implement it in our game. Additionally, programming all those special actions, attacks and win conditions also proved too much work to get it done in a reasonable amount of time. Last, but not the least, the Scorpion's movement system would have to be implemented separately for this single enemy. We had the basic animation set, but making it look fun and realistic in all possible cases would be too much to handle during the time we had left to finish the project. You can always estimate how much time you will need to make something work. However, over time you will learn that most estimates are way off, and there are more things that can go wrong than you can think of. The concept design for the scorpion was very quick and painless, but the technicalities made us drop it altogether. We will tell you how much effort is necessary to make a boss fight work in our next article, describing something you already know well, and what actually made it into the game - the Tarantula Mk V.